Treadwell, NY, home of the Stagecoach Run Art Festival, is a sleepy little hamlet of fewer than 300 people situated on Delaware County Route 14. It’s less than a half hour from Delhi in one direction, and a half hour from Oneonta in the other. But it’s only “sleepy” on the surface. 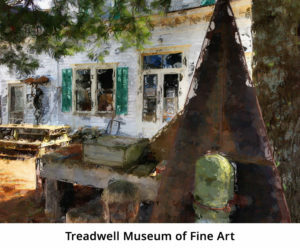 Treadwell is actually a thriving enclave of artists, writers, musicians, and photographers, with the Treadwell Museum of Fine Art, the Bright Hill Literary Center, and the homes and studios of dozens of artists. On or around the July 4th weekend, many of those studios will be open to the public during the Annual Stagecoach Run Art Festival. 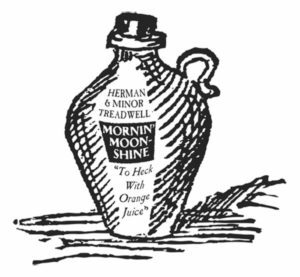 At various times, Treadwell has been called Jug City, East Franklin, and Croton. The Croton House on the other side of Roaring Brook Creek was in the past an inn and an ice cream shop. Today it is apartments, and the portico furnishes space for artists to set up a pottery display and paintings during the Festival.Across the street is the Odd Fellows Lodge, now the studio of Joseph Kurhajec who sometimes spends summers in Treadwell and winters in Paris and the Yucatan. Down Church Street is The Bright Hill Literary Center, where children can sign up for classes. Locals can use the library’s computers, and guest poets read their work twice monthly. The Methodist Church next to the Literary Center is a fine example of early architecture. Hermon and Minor Treadwell were both carpenters and built many of the first residences of the village. The name “Jug City” may possibly be attributed to his custom of filling a 3-gallon jug of liquor regularly every morning from the distillery near the village (see artist’s recreation to the left, ©2013 Steve Monosson). Minor Treadwell served as the first postmaster of the village, holding that office for 15 years, beginning in 1824. 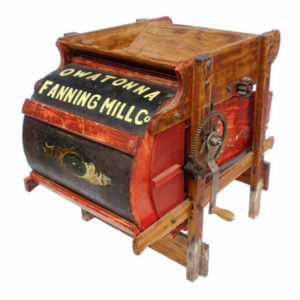 In later years he made fanning mills, a machine for winnowing grain by the action of riddles and sieves and an air blast (see image). The resourceful Minor manufactured his mills in a shop adjoining his home across the brook from the Methodist Church. Most of the homes along the main road were built in the nineteenth century and the architecture is fantastic. So that’s a little background on Treadwell. For some modern day goings-on, we hope to see you at this year’s Stagecoach Run.